If you are a fan of the herbal bak kut teh from Kuala Lumpur, you can now find a very authentic version of it at the basement of Clementi Mall. New ManLee, which opened in December last year, is a franchise of a shop that started in Kuala Lumpur more than 40 years ago. The brand now has three outlets in Kuala Lumpur where they are called Ban Lee and Sin Manli. The Singapore outlet offers a menu of many of the original shop's dishes, including its Signature Bak Kut Teh (from $10.90 for a single-person serving), which comprises pork soft ribs, leg meat and pig's stomach in a robust brew of herbs and spices. There is also a Dry Bak Kut Teh ($7.90 a pot), which is a relatively new creation from Kuala Lumpur. The pork ribs are fried in a claypot with strips of dried cuttlefish, ladies fingers, chillies and a bit of the herbal soup. To please local palates, it also offers Singapore-style bak kut teh with white peppery soup (from $9.90 for Premium Pork Rib With Pork Belly). My favourite is the "black herbal" soup version. Among the herbal bak kut teh I've tried in Singapore, this comes closest to what I've tasted at my favourite shops in Kuala Lumpur. For those not living in the western part of the island, there's good news: New ManLee will open its second outlet here in Ang Mo Kio Hub early next month. Brunch at Bochinche is usually a hearty affair in a buzzy ambience. But for those who do not want to overindulge, there is an item on the menu that is both tasty and healthy. The Watermelon Salad, Mozzarella Cream, Tomatoes & Pumpkin Seeds ($14, above) is a mix of sweet and savoury flavours that will not fail to wake up your appetite on lazy weekend mornings. 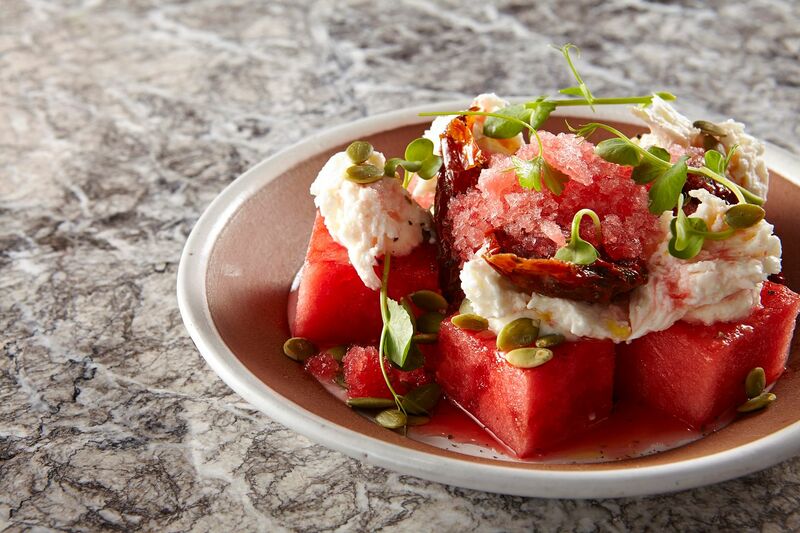 What makes it even more refreshing is the scoop of watermelon granite on top of the salad, which keeps everything chilled. For something a bit heavier, check out the Crab & Humita Croquettes, Spicy Criolla Sauce ($15). Fried to a golden crisp, the croquettes remain moist inside with flakes of sweet crabmeat. There are some new items on the menu too, such as the Organic Poached Eggs, Mushrooms & Potato Ragout, Iberico Shoulder 30 Months ($26). The ragout of portobello mushroom and diced potatoes cooked in tomato sauce is placed on a piece of sourdough bread, topped with slices of Iberico ham and the eggs. It may be a bit indulgent, but it is also very satisfying. Korean barbecue eatery Seorae was packed when I walked in last Tuesday. The 1½-month-old eatery felt crammed and it didn't help that the small tables were arranged so close to one another. But the crowd did not seem too bothered about comfort. Instead, everyone was busy cooking strips of meat on the grills fired by charcoal stoves sunk in the middle of the tables. The eatery specialises in a cut of meat called galmaegisal (left) in Korean, a premium cut of pork skirt that is gaining popularity in Seoul. It is supposed to be juicy and tender, but the pieces of meat on our plate, which are marinated with Korean spices ($21.90), turn out a little tough and dry. The version seasoned with garlic and soya sauce ($22.90), which has a stronger and more aromatic flavour, is better. I also enjoy the pork belly, which is available in three styles as Three Musketeers ($31.90) - original, marinated with Seorae's soya sauce and with spicy sauce. The spicy one is especially good eaten wrapped in a leaf of raw lettuce. Seorae's grill pan is different from any I have seen before. 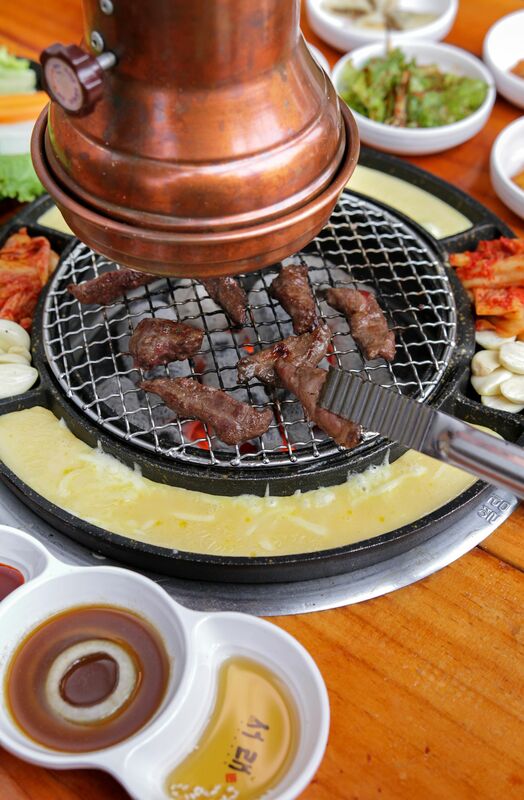 It is encircled by metal pans that are variously filled with kimchi and mixtures of cheese and egg. The heat from the stove cooks the mixes gradually until they form a cake with crispy edges. And heated kimchi tastes good. Chinese New Year feasting is not over yet as the festival goes on for 15 days and the goodies do not stop till Feb 22. Sunday is an important day especially as it is the seventh day of the Chinese lunar year, which is considered the birthday of all humans. 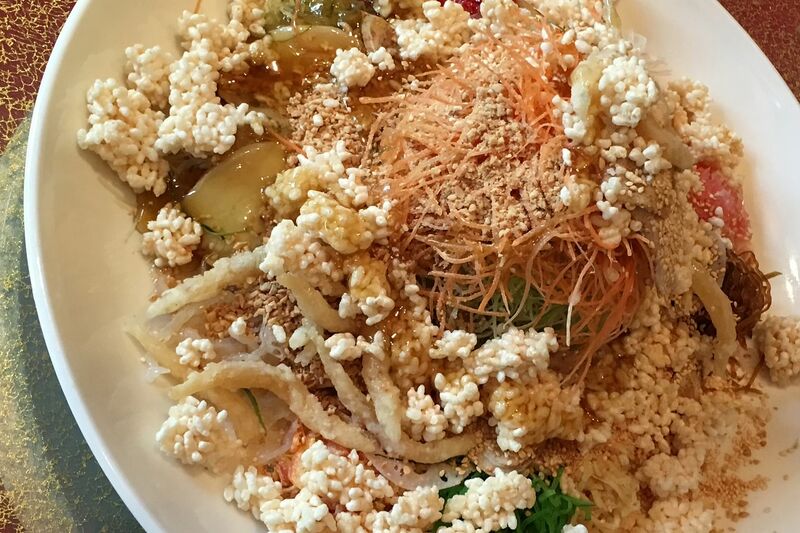 That is also the day traditionally reserved for eating yusheng (raw fish salad). Among the new versions of the dish I've tasted this year, the one at Grand Shanghai stays in my mind for being innovative without coming across as trying too hard. The yusheng (above) comes with a choice of raw salmon or - for those who want to give raw fish a miss - deep-fried whitebait. Both versions are priced at $55 (small) and $98 (large). What makes the dish here stand out is that instead of the usual crispy dough fritters, you find pieces of rice puffs instead. These are bigger and provide more crunch and have a cleaner taste, which is a good balance to the sweet dressing used for the salad. A dish I always enjoy at the restaurant is the Superior Shark's Fin With Chicken & Wanton Served In Casserole ($250 for small, $480 for large), which is also available for takeaway. The delicious white broth is creamy and rich, and sticky with collagen. And for dessert, the Shanghai red date cake ($23), which is fluffy and not too sweet, is just the thing after a heavy meal. Book a meal at Bochinche with Chope.